Denham, United Kingdom, 2017-Dec-04 — /Travel PR News/ —InterContinental Hotels Group (IHG®), one of the world’s leading hotel companies, has announced it will open a new 300-room Holiday Inn Express hotel in Seoul, South Korea in 2018. 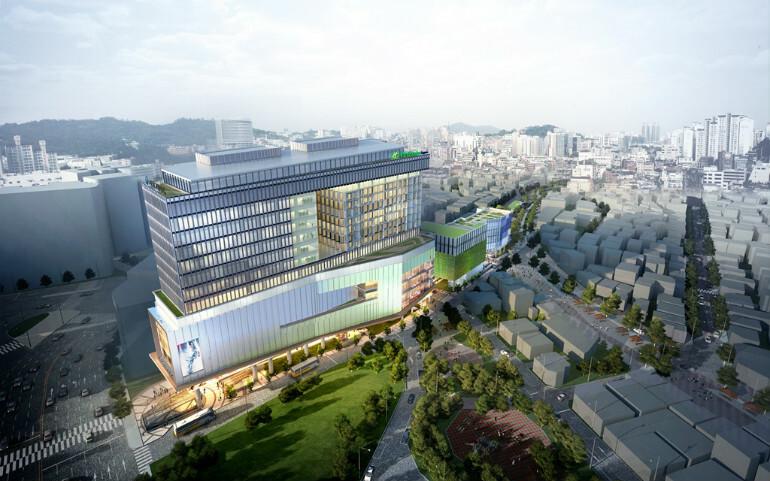 The new-build Holiday Inn Express Seoul Hongdae, in partnership with the hotel’s major investor JEJUair, will be part of Hongdae’s largest mixed-use development, featuring a retail mall, extensive dining options and an office tower. Situated at the main junction of Hongdae just a short drive or subway ride from the Yeouido Business District and Gangnam Business District, the hotel will sit atop both the Hongdae subway station and the Airport Express rail that leads to both Gimpo and Incheon airports. Hongdae, which is short for ‘Hong-Ik University’, is one of Korea’s largest arts, culture and architecture universities and the vibrant campus town is home to bustling walking streets, restaurants, bars, boutiques, night clubs and unique cafes. Over the last decade, South Korea has enjoyed a steady growth in international arrival numbers – thanks in part to the rising popularity of Korean culture, music and dramas worldwide. As a key destination for business and leisure travellers alike, Seoul received almost 80 per cent of the country’s 17.2 million visitors last year. “The lively ‘university town’ subculture at Hongdae, coupled with easy access to the business districts, makes the area an attractive choice for business and leisure guests alike. We look forward to working with our partner, JEJUair, meeting the needs of smart travellers offering exactly what they need and more where it matters” he added. The hotel’s major investor is JEJUair, is South Korea’s largest low-cost carrier and is a member of the well-established conglomerate, Aekyung Group (AK Group). The group is seeking out synergies between JEJUair and their hotel and retail businesses, and has plans to expand its hotel portfolio further. This entry was posted in Hospitality, Hotels, Travel, Travel Management and tagged Holiday Inn Express Seoul Hongdae, IHG, JEJUair, Ken Choi, Rajit Sukumaran. Bookmark the permalink.